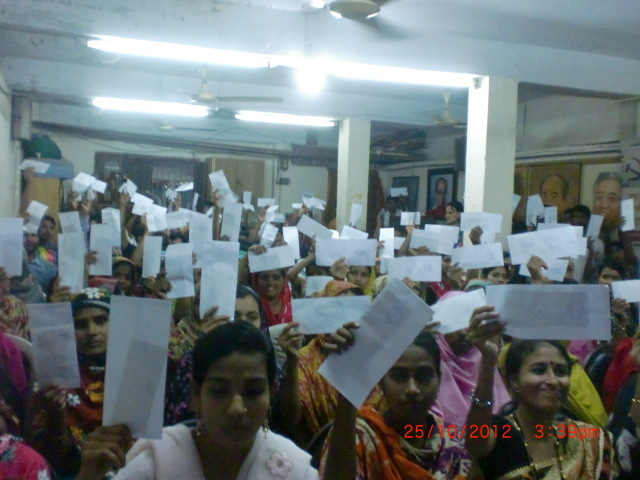 Press release: National Garment Workers Federation of Bangladesh. In a press conference at 11 a.m in Dhaka Unity Hall reporters room , NGWF president Amirul haque Amin mentioned this on behalf of the NGWF. He also added that Wal-mart and other companies – those sourcing from Tazrin fashion and factories in RANA plaza must compensate the Dead’s families, Injured workers and take responsibility for proper treatment , Compensate all workers of Tazrin and 5 factories in rana plaza. NGWF also added Wal-mart , Gap and other companies must sign the Fire and building safety accord , these have yet to sign . They mentioned yesterday 23.05.13 , 38 companies signed the accord. 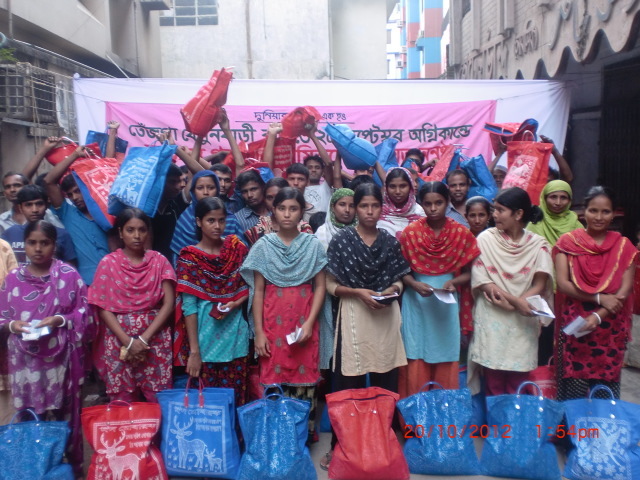 NGWF mentioned today 24th may is 6 months since Tazrin Fire and 1 month since Rana Plaza collapse. 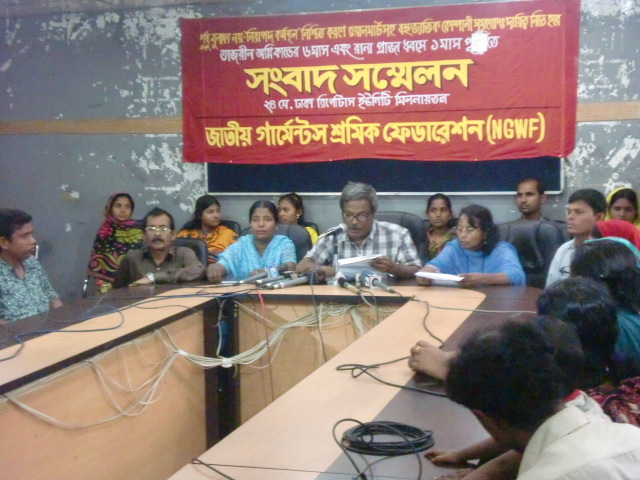 In the press conference , besides NGWF other leaders , 42 injured and family members of the dead of Tazrin and 35 of Rana plaza were present. 1. 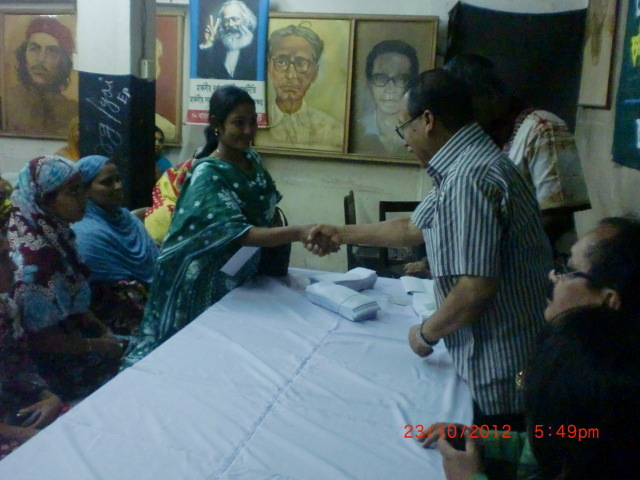 Proper and sufficient treatment for all injured of Rana Plaza and Tazrin. 2. 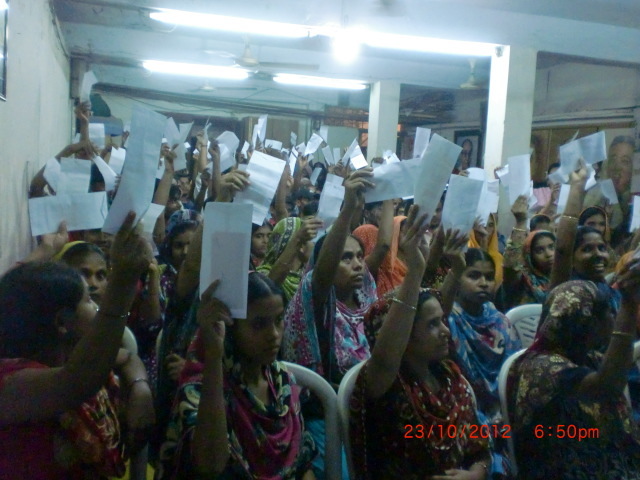 Immediate support for all victims – families of the dead, and injured of both Rana plaza and Tazrin. 3. 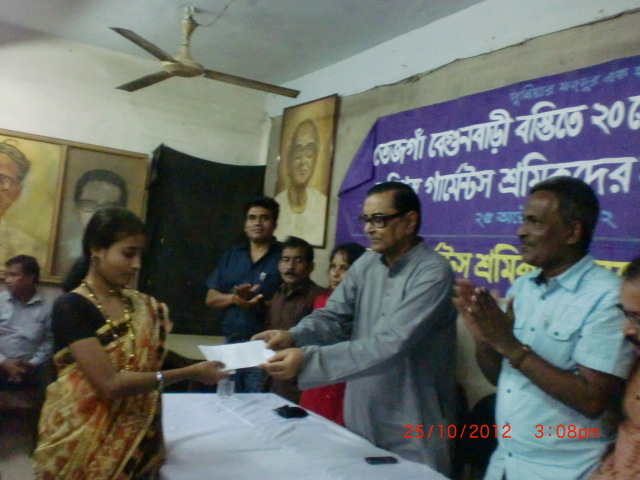 3 month salary as compensation for all workers working in these factories. 4. Compensation for all dead families and injured in the line of Loss of earnings. 5. Murder cases should be filed for the highest punishment against the owners of Tazreen Fashions, Rana plaza and 5 factories in rana plaza. 6. Wal-Mart, Gap and others companies must sign the Accord to ensure SAFE WORPLACE for the garment workers . 7. For ensuring Living wage the MNC,s must pay fair price for the garment products and have to build long term business relationship. In the press conference NGWF also demanded withdrawal of all legal , written and unwritten barriers for the exercise of trade union rights in the garment sector. 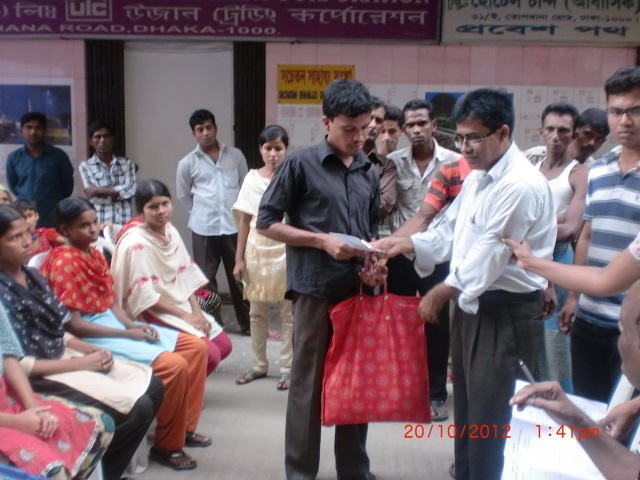 NGWF emergency relief distribution – Bangladesh. There has been one fire after another in the horrible slums where mainly garment workers and other poor people live – the workers themselves feel as if it is part of a plot to clear the cities of slums and poor people. Now the NGWF have started distribution of emergency support to those affected by the fires. In the meantime there have been local collections from workers, members and well-wishers, some friendly International organizations also responded. 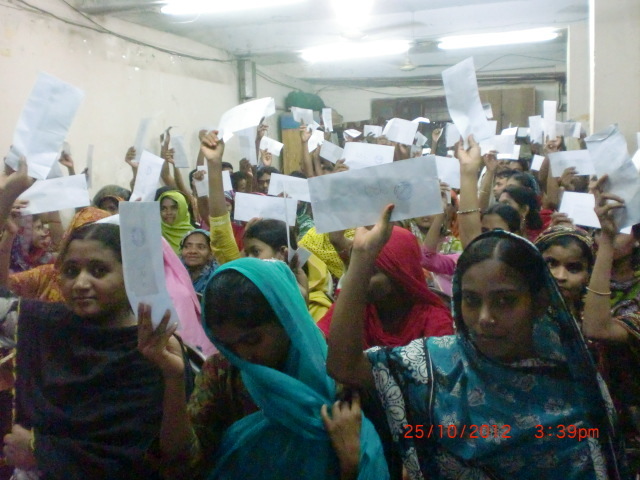 3 proposals were considered to distribute relief packages to the value of 2000 Bangladeshi Taka (BDT) to each worker – equivalent to about £15.34 – either in cash, a mixture of goods and cash or rice and cash. Over 3 days the NGWF provided support to 1200 affected workers out of a list of 3,500, on 20th October each person received one 10kg bag of rice, and BDT 1600 in cash; on 23rd and 25th October they provided BDT 2000 to each person. However this list is still growing for two reasons: many affected workers expected help from the government, factory owners or NGOs of which only one called BRAC responded; secondly many were isolated and did not feel free to come forward until they saw others receiving help. 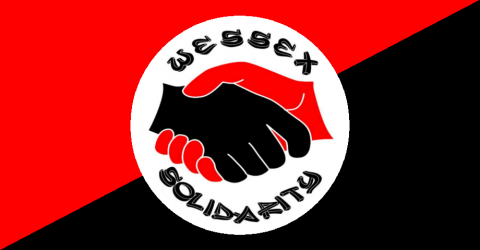 Our own class struggle is futile unless we stand together with our Fellow Workers around the globe. Only by establishing ties with those who produce most of the goods we consume and spend our own wages on can we truly recognize our common interest. We must re-establish the social relationship between producer and consumer which capitalism reduces to the exchange of tokens. Only together can we take on our common enemy in global capital, their fight is our fight. We extend our solidarity to our comrades in NGWF, we hope shortly to have an address to make contributions to their efforts. The Guardian: Why we must own up to the human cost of our obsession with cheap clothes Article from 2010 after 100 workers died in a fire. Just in: a press release from our comrades in the National Garment Workers’ Federation of Bangladesh – more to follow soon. Another fire, 4,000 more garment workers affected seriously. 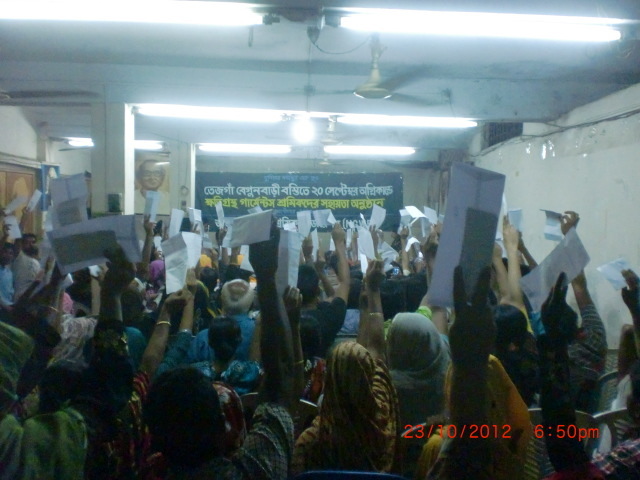 Garment workers held demonstration demanding support for the affected. 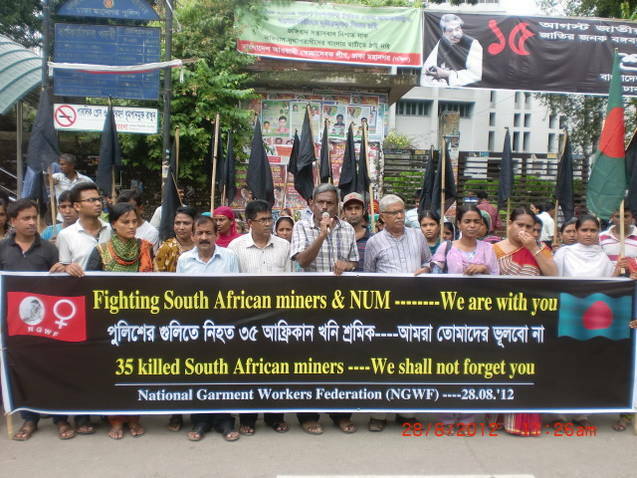 National Garment Workers Federation of Bangladesh, action in solidarity with South African miners.